Are you looking for a home security solution that won’t compromise the look of your house? Crimsafe security screens might just be for you. Security is a priority for most homeowners and there is a good reason for that. There is no greater peace than feeling as though your family and possessions are secure. With so many security screens available, however, the choice is not always an easy one. If you have done some research, you will probably have seen that Crimsafe are ahead of the pack in terms of security screens. Increasingly, homeowners and security companies alike are opting for Crimsafe security screens and there are many reasons for this. Crimsafe is arguably the most popular of security screens for one simple reason: its design. Security screens must be strong, but relatively lightweight and low profile. Combining these two features effectively is a bit of a challenge, but Crimsafe have devised the perfect solution. This solution is the patented Screw Clamp™ method, which holds high tensile woven steel to the doorframe with unrivalled strength. The Screw Clamp™ method works just as its name suggests. Specifically designed screws are used to clamp the high tensile steel to the doorframe so that the screen cannot be forced open. The screen itself is constructed from structural grade 304 stainless steel, which has a special composition for extra strength. This composition enhances the tensile strength of the steel, improving its impact resistance. Of course, strength and durability is important, but so is appearance. Unsightly security screens are one reason that some homeowners are reluctant to install security screens in their homes. If you have a nice view from your window, the last thing you want is to block it with an unappealing metal screen. Fortunately, Crimsafe has an answer to this too. Crimsafe security screens are designed with visual appeal in mind. The screens do not block your view and are powder coated to be sleek and black. The powder coating not only improves the appearance of the screen, it also makes it resistant to rust and corrosion. All of the design features that go into Crimsafe security screens serve to make them the strongest on the market. There are many different ways in which a security breach might occur in your home. To work effectively, your security screen must be capable of withstanding all attempts to breach it. Crimsafe has been designed with a wide variety of factors in mind. The final product that you get incorporates high quality materials with a unique design, for the upmost in security. One of the most common forms of security breach involves forced entry. In particular, this involves some form of blunt object that uses impact to break through a door or security screen. In some cases, intruders have even been known to kick doors, or use their body weight to ram them. 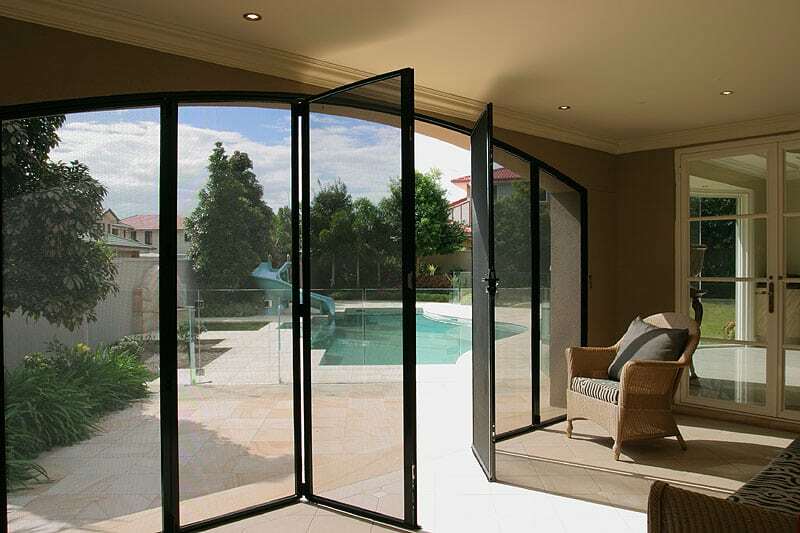 Conventional screen doors are not always well suited to withstand such impact, but Crimsafe has the strength to withstand force time and time again. Crimsafe have conducted extensive tests into their Screw Clamp™ design, which have proven its strength. Additionally, Crimsafe doors come standard with a mid-rail. The mid-rail reinforces the door frame and strengthens the lock, so the security screen with withstand even the harshest of impacts. For many screens, cutting and tearing can be a real problem. For Crimsafe, however, this is not the case. Crimsafe security screens are constructed using structural grade 304 stainless steel. This steel is very high tensile and cannot be cut by knives or other such blades. As well as this, Crimsafe uses a thicker gauge of mesh for added strength. Most security screens comprise 0.8mm mesh, but Crimsafe screens are constructed from 0.9mm woven stainless steel. This makes them 26.5% thicker than standard security screens, which means that they are not susceptible to a security breach by cutting. That’s not the only advantage of thicker mesh, however. Because the increase in mesh diameter is only 0.1mm, it is not visible to the naked eye. This means that despite a 26.5% increase in strength, your view will remain unchanged. Not all intruders are human and Crimsafe screens are built with this in mind. If you live in Queensland then you will surely be familiar with the frustration cause by flies, mozzies and other insects. If you leave your doors or windows open to make the most of a cool breeze, you will have to put up with all manner of annoying bugs. With Crimsafe, you can catch those afternoon breezes without letting any insects in. Crimsafe security screens prevent mosquitoes, flies and other insects from entering your home. As well as this, the mesh does not restrict your enjoyment of the pleasant breezes that make your home comfortable. Corrosion is a threat to security screens if they are not protected against it. Long term rust can compromise the strength of the metal screen, which would allow it to be breached with greater ease. To avoid this, Crimsafe uses stainless steel mesh that is coated in a corrosion resistant powder coat. Powder coating metal is the best way to protect it against rust and deterioration and it looks great. However these are not the only benefits of powder coating. Crimsafe security screens are powder coated with an antistatic coating. This is UV resistant and will not fade in the sun. As well as this it actively repels dust, which makes Crimsafe security screens very easy to clean. By keeping your Crimsafe screen clean, you can ensure that it retains its strength and sleek appearance for many years. This means that you are guaranteed the best protection for you, your family and your belongings, without compromising on looks, airflow and views. At Vincent Security, we specialise in Crimsafe security screens. Get in touch with us today on (07) 3849 4555.